Just a few days ahead of it’s official launch on October 11th, 2011 (or maybe event may get delayed due to Steve Job’s death), pictures and video of Samsung Nexus Prime – Google’s next flagship device – has hit the internet. Earlier complete specs of Nexus Prime were leaked by two different sources that contradicted each other, so we are not going to believe in any of them – but this video looks real, real enough to be shared with our readers. 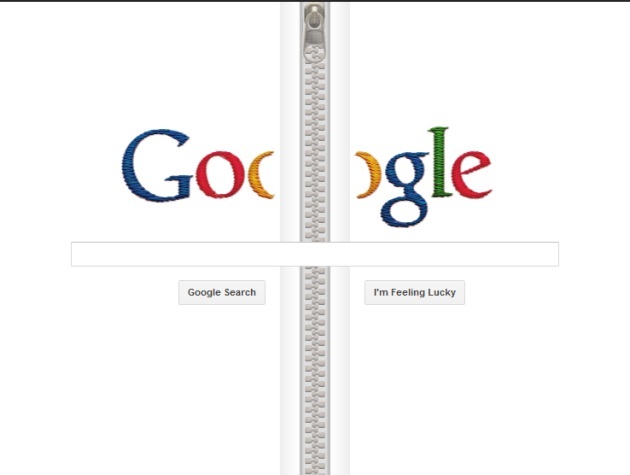 Here you go with the picture, while video is available after the jump. It seems pretty much like Nexus S, the front at least. Though we aren’t sure about the thinness of Nexus Prime. 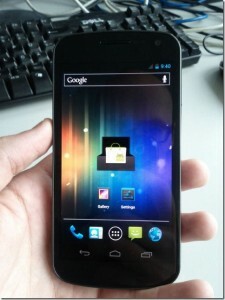 Even the video doesn’t clarify the back side or side-view of Nexus Prime. From picture or video one can’t be certain of the specs, but it appears that a processor of at least 1.2 GHz with dual core is being run with the Nexus Prime we see in the video. RAM, at least 1 GB – and display screen: it’s bigger than Nexus S.
Nevertheless, phone looks pretty awesome with Ice Cream Sandwich running on it. Rest you can see in the video yourself, but I can tell you that user interface with ICH is better than the one we had in Gingerbread or earlier versions. Samsung, the biggest rival to Apple in the smartphone business and which is involved in a number of bitter courtroom battles with the US company, has abruptly postponed its scheduled launch of a new top-end phone next Tuesday. The apparent motive was not to be seen to intrude on the reactions around the death of Apple’s co-founder and former chief executive Steve Jobs, whose death was announced late on Wednesday at his California home. The South Korean company, which said on Friday morning that it expects smartphones to be the main profit engine of its business, had been expected to launch its new Nexus Prime phone, running the latest version of Google’s Android software – numbered 4.0, and dubbed “Ice Cream Sandwich” – on Tuesday at the CTIA trade show. The company would not elucidate, though it is understood that the reason is not connected to any hardware or software problems around the phone. That implies that the decision was taken because it would be seen as too close to the death of Jobs. No new date has been given by Samsung for the announcement. No date has been given either by Jobs’s family for his funeral. Samsung and Apple are battling in a number of court cases around the world, with Apple claiming that Samsung’s products copy significant elements of the appearance of its iPhone and iPad devices, and that it infringes a number of patents. Samsung has hit back by claiming that Apple is infringing a number of its patents, including some on mobile devices: it has threatened to prevent sales of Apple’s iPhone 4S, announced only on Tuesday, in France and Italy. Last year Jobs tried unsuccessfully to intercede in the dispute before it escalated into a full-scale court battle. The first shots in the legal battle were filed in April 201. Samsung, the largest electronics company in the world, announced on Friday morning that it expects to rack up record profits from handset sales. Analysts think that it could have passed Apple in the July-September period for the total number of smartphone handsets shipped around the world. However its other divisions are under pressure amidst squeezed consumer spending. The South Korean firm estimated its quarterly operating profit at 4.2 trillion won (£2.3bn) versus a consensus forecast of 3.4 trillion (£1.8bn) won by analysts surveyed by Thomson Reuters I/B/E/S. That would be down 14%, from a year ago but up 12% from the preceding quarter. Samsung sold 19m smartphones in the second quarter, and analysts expect shipments to have risen to more than 28m units in the third quarter, helping it towards its target for the year of 60m units. Samsung sold only about 1m fewer smartphones than Apple in the second quarter. It plans to release its first smartphone based on the latest version of Microsoft’s mobile operating system this month, Windows Phone “Mango”, while a 5.3-inch screen Galaxy Note, a hybrid of a smartphone and a tablet, is set to go on sale later this year. 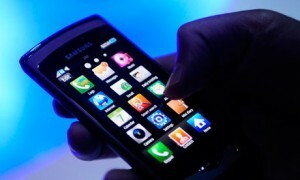 Samsung leads a pack of companies selling phones on Google’s Android operating system. “The Galaxy S II probably played a key role in boosting the company’s earnings and it will continue to do so pretty much unchallenged, until Apple unveils a better new version of iPhone,” said Kyung Woo-hyun, a fund manager at Daishin Asset Management. Samsung, which worked out how to make black and white TVs in the 1970s by tearing apart Japanese models, has become a top global brand over the past decade. It boasts a market value of £76bn, much bigger than the combined value of rivals such as Sony, Nokia , Research In Motion, Toshiba and Panasonic. Samsung’s shares have fallen 5% over the past three months versus a 12% drop in Apple’s shares. • Sony is said to be in talks to buy Ericsson out of its share in their joint venture in the mobile phone business, Sony Ericsson. The companies must decide this month whether to renew their 10-year-old pact that created the company. The deal could be worth up to $1.3bn, depending on what arrangement they come to over the use of Ericsson’s telecoms patents. Yoshiharu Izumi, an analyst at J P Morgan in Tokyo, said the deal could be worth upwards of $1.3bn, depending on what agreement the two reach about the continuing use of Ericsson’s telecoms patents. “Up to now Sony’s products and network services have all been separate. Unifying them would be positive,” Izumi said. “If they can leverage their games and other network services I think they can lift their share,” he added. Should any buyout go ahead, Sony will need to take steps to protect itself from legal challenges to its patents. Thus far the joint venture has been protected from the kind of court room challenges seen by rivals because Ericsson, the world’s largest mobile telecom gear maker, holds one of the largest patent portfolios in the industry. “Sony will definitely want to bolster its portfolio in such a deal so it can defend itself in the most litigious segment of the technology industry,” said intellectual property expert Florian Mueller. Millions of people paid emotional tribute on Thursday to the late Steve Jobs, praising the Apple founder’s vision and creative genius which has left behind a world transformed by his legacy. 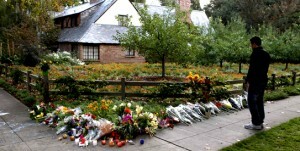 Outside his two-story brick home in Palo Alto, California, grim-faced people stood in the rain beside a growing shrine adorned with bouquets, heartfelt messages and a pile of apples with a bite taken out in tribute to Apple’s logo. The towering high-tech pioneer, who co-founded the company and went on to invent iconic gadgets such as iPods, iPhones and iPads, died Wednesday at the age of 56 after a long battle with cancer. “Steve’s brilliance, passion and energy were the source of countless innovations that enrich and improve all of our lives. The world is immeasurably better because of Steve,” Apple’s board of directors said. Tributes flowed in from world leaders and tech giants, while Apple fans flooded social networking sites to voice their sorrow at the passing of the man who helped put phone-sized computers in millions of pockets. Perhaps the most poignant tribute to Apple’s co-founder was that word of his death spread almost instantly to all corners of the earth on the very devices he had invented. At one point, Twitter seized up under the weight of Jobs-related posts, and analysts have predicted the news will break traffic records. Web users in China, where diehard fans queue for days to get their hands on Apple’s latest products, posted nearly 35 million online tributes. Fans flocked to Apple stores around the world to leave mementos — from the typical flowers, candles and cards to the company’s own products to more apples with bites taken out of them. “I’m here to pay tribute to Steve Jobs, someone in the universe who made it possible for me to be an engineer,” Clarence Labor, who works for high-tech firm Intel, told AFP outside a store in Washington’s Georgetown neighborhood. As he spoke, another man placed a silver iPod on which he had written “Thank You, RIP” outside the shop. Jobs was just 21 when he founded Apple Computer in 1976 with his 26-year-old friend Steve Wozniak in his family garage. From such humble beginnings the company grew into one of the world’s most valuable firms, posting second-quarter profits of $731 billion in July on revenue of $28.57 billion despite the worldwide economic turmoil. Apple shares seesawed on the news of his death, eventually closing Thursday at $377.37, down 0.23 percent from the day before. Wozniak said the two men had had little idea what a revolution they were spawning all those decades ago. “We felt it was unbelievably important, but we never could have envisioned it would grow to what it is today, that it would be such an important part of everyone’s life in so many ways,” he told CNN late Wednesday. Microsoft boss Bill Gates and other titans of the high-tech industry, some of whom had competed with Jobs for decades, agreed. “The world rarely sees someone who has had the profound impact Steve has had, the effects of which will be felt for many generations to come,” Gates said in a statement. The two men were rivals in the race to dominate the market at the start of the personal computer era. But while PCs powered by Microsoft software ruled work places, Jobs envisioned people-friendly machines with mouse controllers and icons to click on to activate programs or open files. Huge questions now hang over the future of Apple, with the spotlight on Tim Cook, who was made chief executive of the Cupertino, California-based company in August after Jobs’s resignation. Just a day before Jobs died, Cook had presided over the launch of the new iPhone 4S in a move that failed to dazzle investors. Under Jobs, Apple introduced its first computers and then the Macintosh, which became wildly popular in the 1980s. But he left Apple in 1985 after an internal power struggle and started NeXT Computer company, aimed at businesses. Jobs reconciled with Apple in 1996 with the company buying NeXT for $429 million and Jobs ascending once again to the Apple throne. Jobs revamped the Macintosh line, launching a “post-PC era” in which personal computers give way to smart mobile gadgets — the iPod, iPhone and iPad, as well as the popular iTunes website. Publisher Simon & Schuster announced Thursday that it was pushing forward the release date of the first authorized biography of Jobs by nearly a month to October 24. Pre-orders boomed on online retail giant Amazon, where the book has topped the best-seller list. Steve Jobs is dead. The Apple chairman and former CEO who made personal computers, smartphones, tablets, and digital animation mass-market products passed away today. We’re going to miss him. Deeply, and personally. Steven P. Jobs passed away on October 5th, 2011 after a long struggle with pancreatic cancer. He was just 56 years old. We mourn his passing, and wish his family the very best. Let’s address this up front: Gizmodo and Steve Jobs had, at best, a tumultuous relationship. Yet no matter how much he may have hated us, we admired him. No, that’s not quite right. We loved him. While he was gone, he started NeXT computer. The NeXT operating system would form the underpinnings of Apple’s OS X, and iOS. He also started the best movie studio of the past 30 years. Pixar’s films were innovative, to be sure. It pushed the boundaries of CGI to such an extent that even today its early films still look great. But technology is only a tool. As with everything else he understood that great technology alone is not enough. It must be human to have an impact. Pixar movies tell stories. They make grown men cry. That was the impact of Steve Jobs. He accomplished so many things, in so many fields that it’s tempting to compare Jobs to someone from the past. A Thomas Edison or a Ben Franklin or even a Leonardo Da Vinci. We tend to do that because it helps us understand. But it does him a disservice. He was unique. His own person. Our own person. They will remember his flaws, too. When Atari hired Jobs and Woz to write the code for the iconic Atari game Breakout, the pair earned a $5000 bonus for completing the work, largely done by Woz. But Jobs kept the bonus a secret, and only paid his partner $375. When his daughter Lisa was born in 1978, he spent two years denying he was her father. His denials forced her and her mother to support themselves on welfare. In the workplace he’s often been described as temperamental and even petulant. He could be arrogant and unforgiving. He once famously asked of a critic “what have you done that’s so great?” For Jobs, the answer to that question was very nearly unlimited. 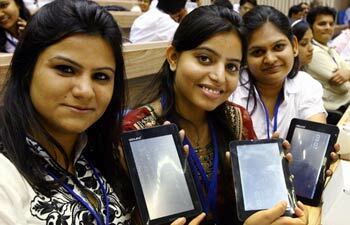 The world’s cheapest tablet PC, priced at around Rs 1,200, will now be available to students in the country as part of the government’s programme to expand education through information technology. The tablet PC, named Aakash, will cost the government Rs 2,276. It will be given to students after subsidising the price by up to 50 per cent, HRD Minister Kapil Sibal said today while unveiling the device here. “The tablet is for Rs 2,276 which includes taxes and cost of transportation. The government will provide subsidy of 50 per cent to institutes buying it. It will cost around Rs 1,100 to Rs 1,200 to institutes,” Sibal said. An initially order of 1 lakh devices has been placed with device maker Datawind, Sibal said. The procurement order will be scaled up later with an aim to bringing down prices further, he added. “If 10 lakh pieces are ordered, then it will be priced at Rs 1,750 (cost to the government) which will include transportation cost and vendor’s profit as well. So, I have fulfilled my promise of USD 35 tablet,” Sibal said. Sibal said he will ask telecom vendor ITI to manufacture it and will seek support of other industry players to scale up the production and reduce costs. Aakash is a 7-inch touch screen tablet PC based on Google’s Andorid 2.2 operating system with 366 Mhz processor and 256 MB RAM. It has 2GB Flash internal storage capacity and can support data storage of up to 32 GB through on an external disk. This tablet will have battery back-up of 180 minutes. Datawind will launch this device in November for general public at a cost of Rs 2,999 per piece, Suneet Singh Tuli, CEO of the company, said. Initially, the device will be made available to students pursuing Graduation. Later, it will be distributed among students of class IX and higher classes. About 500 pieces were given to students at the function today for evaluation and subsequent upgrade, if necessary. Students will be able to access thousands of content available on the ‘Sakshat’ portal and other educational websites. An HRD ministry official said an option of giving the device for a particular period is being explored. Last year in July Sibal had unveiled a prototype of the device and announced developing it at cost of around USD 35. To ensure complete transparency and a level playing-field, the National Mission on Education through Information and Communication Technology (NME-ICT) decided to task IIT (Jodhpur) with the job of procuring and testing these devices based on the design and specifications that the Mission?s team had finalised. IIT Jodhpur had floated tender and the lowest bidder quoted an ex-factory price of USD 37.98 which was close to the cost mentioned by Sibal. This cost comprised cost of components and material as well as manufacturing expenses. The final landed price of USD 49.98 (Rs 2,276) per unit included taxes, levies, and charges like freight and insurance, servicing and documentation etc. Aakash will carry one-year free replacement warranty from the manufacturer.